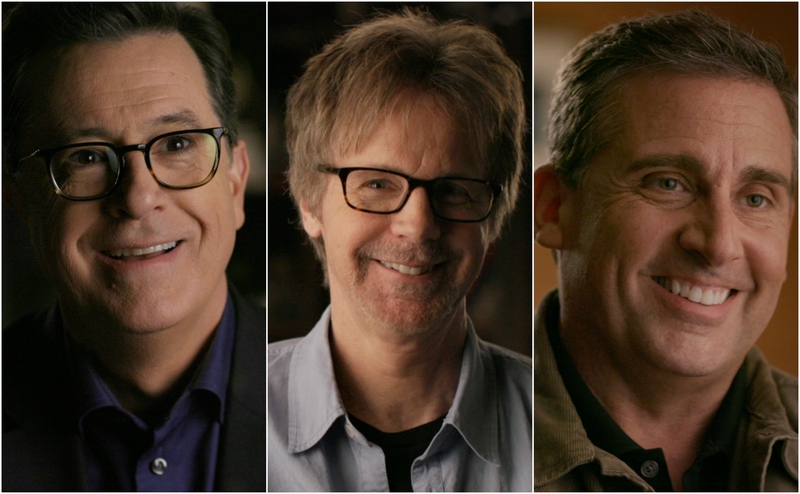 Too Funny to Fail: The Life & Death of The Dana Carvey Show on Hulu is my new favorite comedy documentary! Too Funny to Fail chronicles the rise and fall of The Dana Carvey Show which aired for a brief 7 episodes on ABC in 1996. The show employed comedy greats like Dana Carvey, Robert Smigel, Steve Carell, Stephen Colbert, Louis C.K., and more. Seriously, with that kind of talent, what could go wrong? Apparently… everything… absolutely everything could go wrong. Dana Carvey was hot off Saturday Night Live when he decided to try his hand at prime-time sketch comedy. After working with Robert Smigel on SNL, Carvey joined forces with his friend once again for a new project. Smigel and Carvey were quick to hire two no-name comedians from Second City: Steve Carell and Stephen Colbert. With an unknown Louis C.K. as the head writer, The Dana Carvey Show seemed like an unstoppable force of nature… which might have been the case if they had been on a network like HBO. Instead, the show landed on ABC, a network recently purchased by Disney, and scheduled to air right after the family-favorite sitcom, Home Improvement.